Wild Apricot is member management software for associations and non-profits. It helps you with the 'boring stuff' such as managing contact records, payments, website updates, event registrations, mass emails and other communications. Wild Apricot is web software that starts at just $25 a month, including free upgrades and support. There are no long-term contracts or additional fees. Sign up for a free trial in ten seconds and see for yourself. Our next update — release 3.0 — has entered the final stages of testing. We have decided to extend the testing period for a few more weeks to give our QA and development team more time to find and squash all the bugs, as much as possible. Our current plan is to release version 3.0 around May 20th. For the list of key changes, see last month's update. 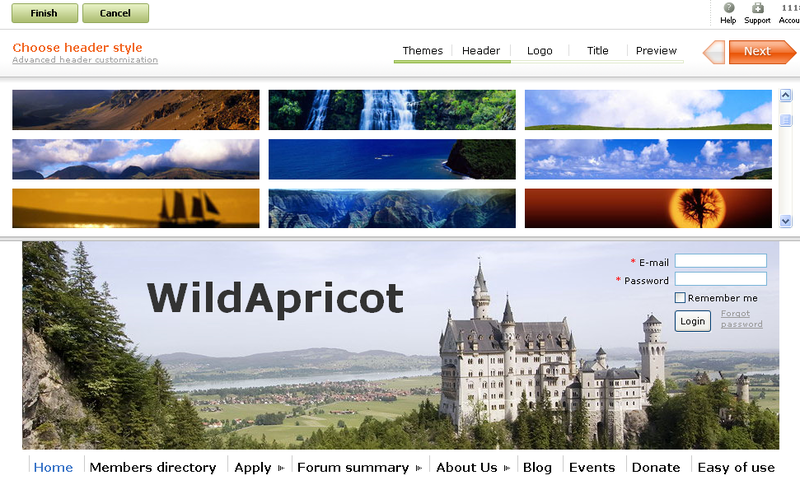 One other item in v 3.0 we have not listed before is the addition of several hundred new header background images that you can use to spice up your Wild Apricot templates. Since version 3.0 changes the fundamental way that the data records are stored, we are preparing a special FAQ page to explain key changes in functionality. This particular web page will be published and notice sent out to our clients in advance of the upgrade — so that you understand the main changes that you will see in your account after the upgrade and can ask our support team any questions. We are working on a revision of our online documentation pages to bring them up to date with changes in version 3.0. These new and updated help pages will be published together with the new version. Advanced search capabilities for contacts (similar to Advanced search for member records). For example, you'll be able to find all people who have not registered for a particular event or people who have made donations in the last 12 months. 'Art text' — ability to create stylized text with various 'special effects' not available through the standard fonts (this is done by generating an image based on the text you enter). We have redesigned the structure of our online documentation website to make it easier to navigate to the right place. We have also invested many hours to investigate the mysterious occasional database glitches that have been affecting some clients (resulting in 'Internal error' messages and other problems). We have found ways to reduce the occurrence of these with some temporary patches — and in version 3.0 we are releasing a number of code changes which should eliminate these problems altogether. Jay Moonah has joined our team as VP of Marketing. Prior to Wild Apricot, he worked at the digital marketing agency 58Ninety, as well as at Sun Media, CBC, the University of Toronto and Ryerson University. He believes strongly in the need to create real connections with customers, as well as the need to respect their time and attention. Outside of work, Jay is an active podcaster and musician. I look forward to seeing the updated version of the software. I also hope that there are more design templates to use. It would be easy for an expert to customize the web-design, but more choices on various web design templates would give more opportunites those who don't have a good experience on web design. I am really looking forward to seeing the new design templates which would attract more people to my websites. Joshua, version 3.0 will include a new set of 7 very nice templates and hundreds of very cool header backgrounds so I think it should be a big improvement in this regard.